Aliki (pronounced - short a, lee, key) Brandenberg has published over 50 fiction and non-fiction books for children including many books that she illustrated for other authors such as Joanna Cole. She graduated from Philadelphia Museum College of Art in 1951. In 1956, she traveled through Europe to practice her art, but also to learn more about her Greek heritage. At this time she met her husband Franz and they married in 1957. During the same year she published her first book, The Story of William Tell while living in Switzerland. The approach Aliki takes to creating fiction and non-fiction books is completely different. According to an article on Greenville Public Library's website, her fiction books are written quickly after something triggers a memory of an experience from her life. Her non-fiction books require time consuming research and a "complete fascination with the subject". I was excited to celebrate Aliki's birthday this week, because my daughter fell in love with her non-fiction book, Mummies Made in Egypt after watching a Reading Rainbow episode when she was 4 years old. I remember being so excited to take her to the science museum to visit a mummy exhibit so she could see a mummy in person. However, once we stepped foot into the exhibit it was no longer exciting, but SCARY! Since she has watched the Mummies episode about a dozen times I thought I would try another Reading Rainbow episode that accompanies Aliki's Digging Up Dinosaurs. First, we read the book and then watched the episode which is posted below. Aliki's goal for non-fiction is to “write complicated facts as clearly and simply as possible, so readers…who know nothing about a subject learn a great deal by the time we are finished.” Your kids will learn a lot after reading Digging Up Dinosaurs, and the Reading Rainbow episode extends beyond the book by showing an actual site with dinosaur bones and paleontologists working at a laboratory. 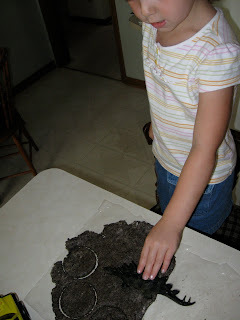 I found a recipe to make Coffee ground fossils that I thought would make great activity for celebrating Aliki's birthday. We read through the recipe and began making the dough. After completing the first few steps of the recipe we read Aliki's book Fossils Tell of Long Ago . This book discusses more than dinosaur bone fossils but also fossils of other animals, imprint fossils, and amber. At the end of the book, Aliki encourages kids to make "one-minute-old" fossils. We finished our recipe and then searched the basement for toys to make impressions. My daughter didn't care for the smell of the coffee in the dough, but loved making impressions of all the items she picked. Our dough took some time to dry, so I think next time I might bake it to speed up the process. In addition to Aliki's non-fiction books we read quite a few of her "true" fiction books that Aliki writes from personal experiences or experiences of her family. We really liked Quiet in the Garden about a little boy's observations in a garden. Aliki's latest book Push Button , about another boy who injures his finger pushing lots of buttons but as a result discovers many other activities he loves to do, was my son's favorite. Coffee ground fossils sounds like an interesting activity. I'll have to try that with my kids. Aliki is a favorite of ours - love your ideas!